Blue shirt with white detailing, from SS Homme; pants, from Tommy Hilfiger. Both in Mumbai. Shoes, Amol’s own. For Impression, his most challenging creation so far, he sat in one place for three consecutive days while henna was applied to his upper back, followed by an adhesive which was later peeled off to make a ‘jacket’. “Like Impression, Detritus and my series of dust objects were created to make viewers feel disgusted as a response to the visual. Surprisingly, they turned out to be the most appreciated!” says Amol Patil, whose showcase at the Pune Biennale 2017 earlier this year met with rave reviews. 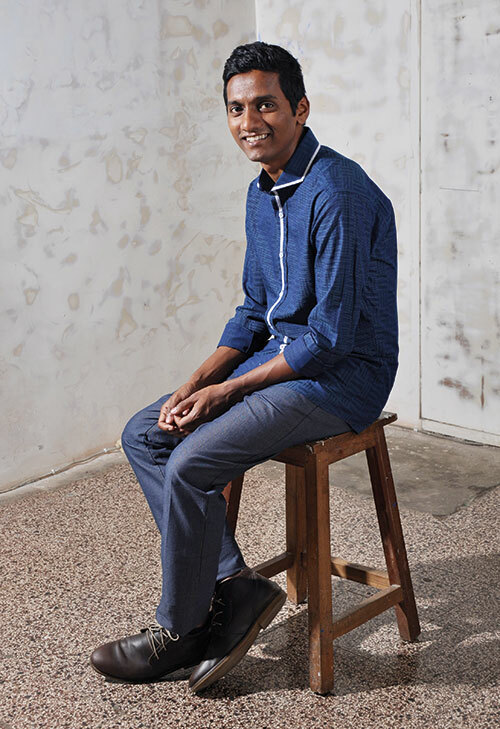 Amol, whose first solo show was held at Clark House Initiative in Mumbai in 2013, is greatly influenced by his grandfather, a povada or Marathi spoken-word poet and oral historian on B. R. Ambedkar, and his father, an avant-garde Marathi theatre artiste who staged plays on inequality and mill tragedies that affected local communities. “Even though I knew about these problems as a child, I never thought about them from the perspective I have today. A lot must have changed from then to now, yet justice is what we all search for through our work.” While both have shaped his world view, he also considers Francis Alÿs an inspiration, as well as the works of Roman Ondak. “Alÿs’ video and performative works inspire me because of their simplicity and humour,” explains the 30-year-old.